Urine fertilizer - guidelines for using it for the garden. Cabbage: 100 pounds N per acre per year. Tomatoes: 150 to 200 pounds N per acre per year. Too much causes blossom end rot. Watermelon: 150 pounds N per acre per year. Too much causes blossom end rot. Click here for a list that covers more crops. The numbers above are for commercial growers who use chemical fertilizers. Since I use organic methods, I don’t need nearly this much supplementary nitrogen. However, at least this list shows which plants require more nitrogen and which require less. Here’s a great way to use urine fertilizer in the garden. Mulching items such as mulched leaves or wood chips are rich in carbon and contain phosphorus and potassium, but very little nitrogen. Mulches need nitrogen to help break them down. 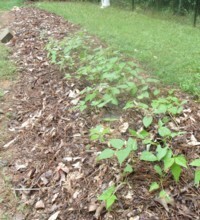 When mulches are combined with nitrogen, they provide the major nutrients for my garden. So here is what I like to do. First, to help suppress weeds, I spread a single layer of non-glossy newspaper over the ground (which I didn't do in the picture). Next, I add mulch to a depth of 4 inches. Then I use my little gardening shovel to move the mulch aside, punch a hole through the newspaper, and make a shallow hole in the soil. Next, I sow or transplant into the dirt. I don’t move the mulch back against the plant until the plant grows above it. Once I have planted, I like to apply humic acids and sea minerals over the top. The humic acids help with germination, and help to break down the salts in my urine fertilizer. They also cause the mulch to begin decomposing, which releases phosphorus and potassium to my garden. The sea minerals provide needed trace minerals. An ounce of humic acid and a teaspoon of concentrated sea minerals, diluted with water, treats about 200 square feet of mulched garden. Next, I put some of my day’s urine fertilizer into my watering can, fill it with water, and use it to water the mulch. The mulch helps to protect the roots from the high nitrogen content of the urine, and the urine provides nitrogen needed to slowly compost the mulch right in my garden. 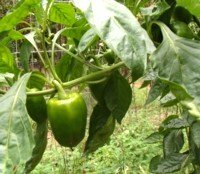 How much urine fertilizer does my garden need? As a ballpark figure, a liter of urine will treat 350 square feet of garden space (4' x 88') if done weekly over 7 months. By the end of 7 months, you will have applied 100 pounds of nitrogen per acre. Increase or decrease application according to individual plant needs, as listed above. More urine may be applied when plants are in the growth stage, and less when they are putting on fruit. Use more for plants such as cucumbers, squash, tomatoes and corn that need more nitrogen to put on fruit. Use whatever urine is left over to fertilize bushes, trees or lawn. If leaves are yellow or pale green, they probably need more nitrogen. Too much nitrogen can cause plants to produce a lot of leaves but bear little fruit. It can also cause leaves to curl, and make plants more prone to insect attack. Please visit my home page, Healthy Vegetable Gardening. Happy gardening!